An air of Mediterranean magic surrounds this modern complex of rounded vacation homes, situated in the midst of lush local vegetation with cacti, palms, agaves and oleander, on the Maddalena peninsula near Syracuse. Anyone who loves snorkelling, diving, bathing and generally splashing around will savour the luxury of this complex. Guests have direct access to the rocks and sea in the Plemmirio nature reserve from the houses themselves. Each of the buildings, equipped with all modern comforts (air conditioning, LCD television, dishwasher, microwave), has two comfortable bedrooms and a bright and spacious living, dining and kitchen area. The furnishings are straightforward and colourful, tastefully accentuated by occasional ethnic pieces. 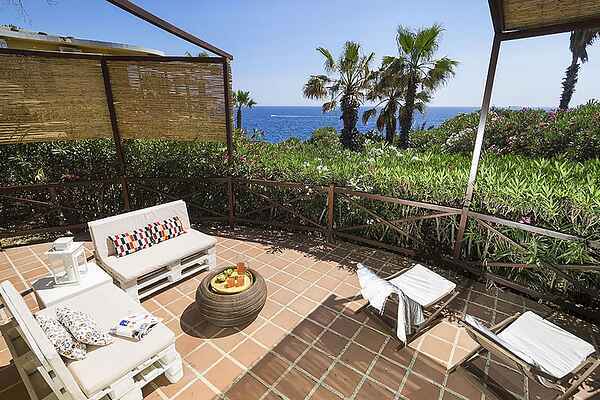 The large terraces offer a captivating view of the sea. For those who want to top up on culture rather than just enjoying the ocean, the surrounding area has plenty to offer. For example, the baroque pearls of Syracuse and Ortigia are wonderful historical sites but also perfect for those interested in theatre and other cultural events.